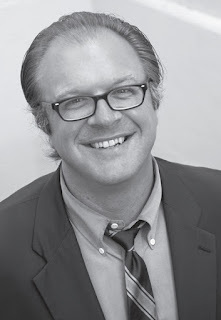 Jim Nelson’s latest novel Bridge Daughter was published in June by Kindle Press. (He joins me as a Kindle Scout winner.) His other books include Edward Teller Dreams of Barbecuing People and A Concordance of One’s Life. He lives in San Francisco. How did you develop your idea for your most recent work? For a different (abandoned) project I’d developed a character, a bookish teenage girl who learns to make origami cranes thinking she’ll get a magical wish after folding a thousand of them (senbazuru in Japanese) in one year. The book was a non-starter but I wondered if I could find another home for her. Taking these and some other scraps of inspiration I had in my writing notebook, I spent the rest of the day outlining Bridge Daughter. Within a day or two I’d written the first chapter. For Bridge Daughter I looked to Patricia Highsmith, Graham Greene, and Kurt Vonnegut for inspiration. In my mind, Highsmith is sui generis in American literature, an author who stripped down the tough-guy novel and moved its mean streets to the petty backbiting world of the petit bourgeoisie. (She was also a master of dialing up tension one Fahrenheit at a time.) Since I knew Bridge Daughter was going to be a thriller (of sorts) set in suburbia, I looked to her for guidance on just how to pull that off. 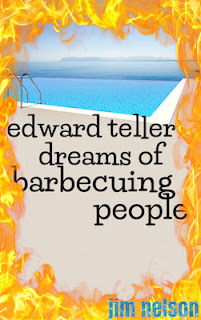 I’ve always admired Greene’s concision, his “proper words in proper places.” Unlike my last novel, Edward Teller Dreams of Barbecuing People, I felt Bridge Daughter’s drama was charged enough without a stylized and talky narrator, so I kept Greene’s clean diction in mind as I wrote. Since I was writing about a pregnant thirteen year-old girl doomed to die in a few months, Vonnegut’s gallows humor and fatalism seemed appropriate. I read a few of his books while writing Bridge Daughter to keep my spirits up. Oh, I overwrite. The first round of edits is almost always deletions. My novella Everywhere Man wound up at half the size of the first draft. 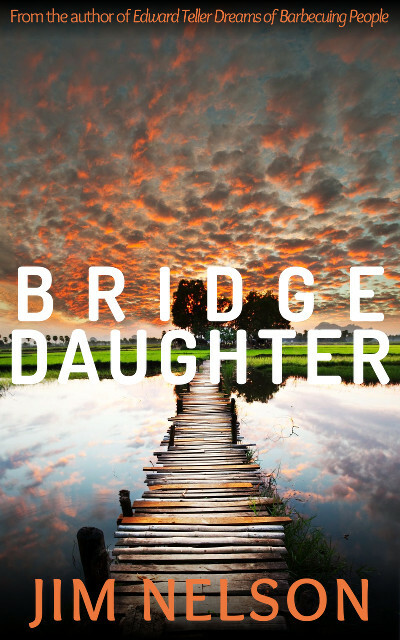 The first chapter of Bridge Daughter I mentioned earlier was dropped entirely during the revision process. When I cut a scene, or even a chapter, and realize later I don’t miss it at all, that’s the kind of editing I like. A plotter, to be sure. I’ve done some work by the seat of my pants, but it rarely results in anything I would call successful. The past few years I’ve been studying Syd Field’s three-act form. Syd Field is something of a legend in the film industry for preaching a strict adherence to narrative structure: By page 30, this must have happened, by page 60 that must have happened, and so on. M. J. Vigna’s Deadly Deadly thoroughly impressed me. The author had such command over the subject matter, I felt in good hands throughout the novel. It’s also a rejoinder, of sorts, to the American Western genre and its idolatry of loners doling out justice. I’ve not read as vivid and surefooted a depiction of life on the high desert since The Treasure of the Sierra Madre. I gave it four stars on Amazon, but in hindsight I should’ve given it all five. I collect film soundtracks and find them good music for writing. It helps they’re largely instrumental, as I find vocals distracting when I’m writing. And if you think about it, soundtracks are designed to help convey a narrative, so it makes sense to pair them with writing fiction. Right now I’m listening to the soundtrack for Max Payne 3 (a filmic video game). In the past I’ve written to soundtracks for Captive, Naked Lunch, The Man With One Red Shoe, Ascenseur pour l’eschaud, and others. I’m mellow about grammar in fiction. If meaning is communicated well, break out the bubbly, I say. Keep your language fresh, that’s important to me. Feature writing (newspapers, magazines, blogs) I’m more critical of. Here’s the thing: I don’t like sentences that open with “Here’s the thing:” Overuse of the em-dash—adding punch to a flabby sentence—has become our generation’s writing crutch. And using “well” with glib repetitions to appear cute and informal is, well, cute and informal. None of these are language errors, I just wish writers would refrain from using them. It’s dumbing-down our language and, by extension, our discourse. I’ll put a book down if it doesn’t capture me. I used to worry I was setting aside books because they weren’t fast-paced enough, but later I quit blaming myself. I don’t need action or adventure to read through a book. Give me a compelling character and give that character a compelling situation. There’s too much avant-gardism in American literature today. It’s created a sense in authors that it’s the reader’s responsibility to sit still and listen. Fiction is a negotiated experience between the reader and writer. Meet me halfway and I’ll devour your book to its last word. Be true to yourself and write what you want to read. Find characters and situations that intrigue you and follow them where they lead you. My worst writing is the writing I did thinking it would satisfy a particular reader, editor, or publisher. My best writing is the work I did thinking “No way in hell is anyone going to want to read this,” only to discover I was wrong. Young Hanna thinks her thirteenth birthday will be no different than the one before—until her mother explains the facts of life. Hanna is a “bridge daughter,” born pregnant with her parents’ child. In a few months she will give birth and die, leaving her parents with their true daughter. A mature bookworm who dreams of college and career, Hanna is determined to overcome her biological fate. Then she learns of an illegal procedure that will allow her to live to adulthood…at the cost of the child’s life.